Over the last week we worked our butts off to get past a few humps that were holding back the site from being "production ready". We needed to address a few little things that were ugly/silly/not very usable. 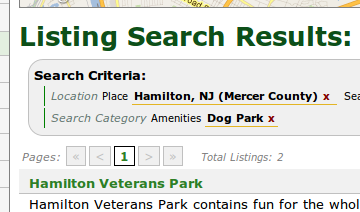 Updated Your Town listing pages.. The Your Town area is something that will become more and more vital to GetOut over the next few months... or even weeks. To prepare for those changes, we updated how we handle displaying the listings on the pages altogether. For example, if you look at the Monmouth page..
We have added tracking code all around the site to see who likes what, and what is never used. We hope that this allows to really spruce up the joint long term. The changes we made over the last week have set us up for some cool things coming down the road. We are working to change the flow of the search page, change the Your Town pages (lightly mentioned above), as well as start the "Groups" section. The Groups page will help promote local groups that do good things outdoors. Enjoy this 18 hole mini golf course next time you are at the jersey shore! Colonial Park, located in Franklin Township, offers a spectacular variety of features and activities for park visitors.